The Samba Volta was one of the most challenging steps FOR ME when I first started learning the samba. What makes the Voltas challenging, are the leg positions, timing, bounce, and hip rotations. To improve effectively, I challenge you to video yourself before you do this set of Check-ups, then compare yourself to the videos below and see if you are doing more NOPES or YUPS. Any questions, shoot me a comment below! ​1. Keep the Back ball of foot planted with heel turned forward (i.e. : turnout) and don’t rotate that foot when you cross. 2. Keep your hips pointed more forward and not towards the direction you are traveling. 3. Make your side steps bigger and cross steps smaller. 1. Keep your back heel lifted throughout the voltas. 2. Lift your back heel as high as you can while maintaining pressure in ball of foot. 2. Squeeze your inner thighs together when the feet crosses in front. 1. 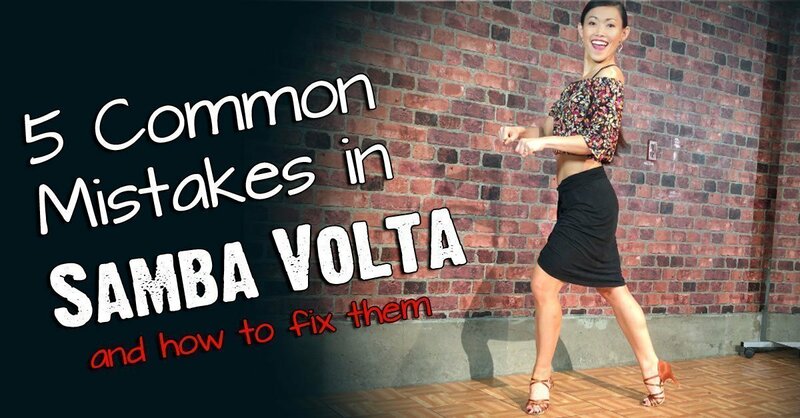 Doing a samba volta is kinda like doing a crab walk… i.e. : you are moving sideways. 2. Keep your crossing step just that and not a forward step in direction of travel. 3. Keep your hips facing forward, not in direction of travel. ​4. Straighten your knees when you take a side step. 1. Rotate the hip after you cross in front. 3. Keep your knees soft after you cross the legs. The Samba volta is certainly not easy. If they are, everyone would do them correctly. So, be patient with yourself and try working on correcting one technique at a time. Focused practice is key… work on correcting one dance technique every week. Before you know it, you’ll be a Samba volta -ing butterfly! Love the Samba? Check out these other Samba Steps! Subscribe to our mailing list to get fun dance and workout videos & tutorials! We will never sell or rent your email address to anyone. We value your privacy and hate spam as much as you do!